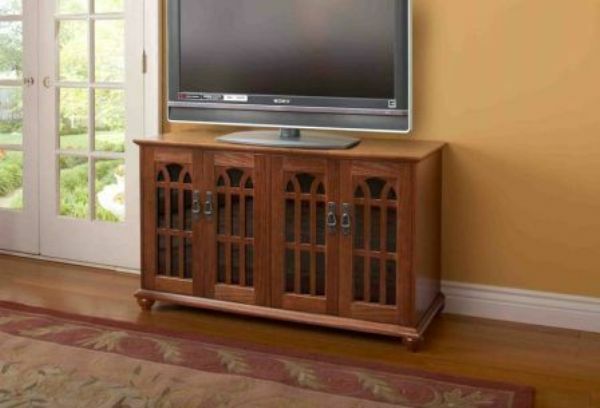 This beautifully styled solid oak storage cabinet is one of our best sellers. Handcrafted furniture quality in a popular mission design. Hand rubbed oil finish in your choice of oak or merlot. Made of solid oak except the back plywood panel which is made to match the same finish of the cabinet. 15 Adjustable shelves made of solid oak with a lacquer finish. 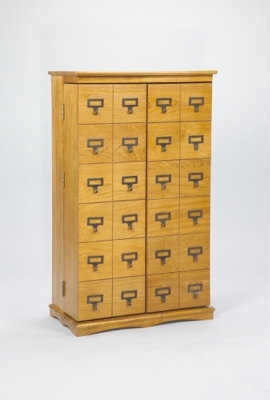 This beautifully styled solid oak storage cabinet is one of our best sellers. Handcrafted furniture quality in a popular mission design. Hand rubbed oil finish in your choice of oak or merlot. 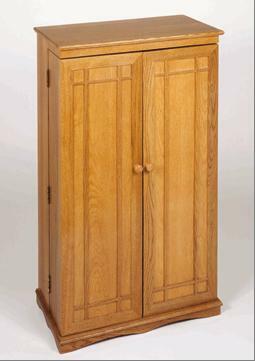 Made of solid oak except the back plywood panel which is made to match the same finish of the cabinet. 15 Adjustable shelves made of solid oak with a lacquer finish. 5 adjustable shelves are in the main cabinet and 5 in each door. Capacity: 612 CD's or 298 DVD's or BluRays or 172 VHS Tapes or a variety of Audio Cassettes. 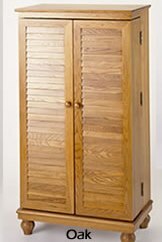 Doors are constructed with dovetail joints and heavy duty antique finish door hinges. Fully assembled, just position the shelves to your desired height and screw in the 4 round balls into the bottom of the cabinet. The cabinet without the balls is 40 in height. Capacities: 612 CDs. 298 DVDs. 172 VHS Tapes.